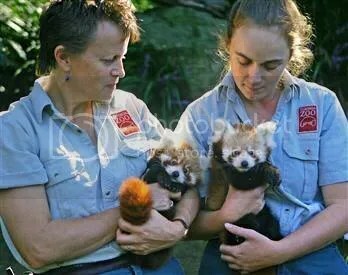 Twelve-week-old red panda cubs Tenzin (held by zookeeper Lisa Abra at left) and Jishnu (held by Bobby-Jo Vial at right) are displayed to the media at Taranga Zoo on Wednesday. SYDNEY, Australia – Twin red pandas made their public debut at Sydney’s Taronga Zoo on Wednesday, the latest additions to a breeding program that aims to ensure the survival of the endangered species. Zookeepers cuddled and showed off the 3-month-old males as they tried to weigh the wriggling cubs on some scales. One is named Jishnu, Nepalese for “bright” or “triumphant,” and the other is named Tenzin after the famed Everest climber Tenzing Norgay.